Please read and understand these Terms and Conditions. If you have any concerns or problems, please contact us before you make a booking or purchase a Gift Card. Treat your ticket similar to that of any other Airline ticket as our Terms and Conditions are comparable to the rest of the Aviation Industry. Due to operational requirements on the morning of travel, Outback Ballooning may arrange for your flight to be carried out by another CASA approved balloon company. In such instances, Outback Ballooning accepts no liability in connection with such services or for any loss, injury, or damages in respect to person or property. Outback Ballooning reserves the right to alter contents of product when deemed necessary. If payment is not made at the time of booking, credit details are required to secure the booking. You will not be charged in advance. Payment can be made on the day by cash, EFTPOS and credit card. In the event you need to alter or cancel your booking certain fees apply. – Any flight cancelled within 24 hours prior to flight date will forfeit the full fare per person and will not be given a refund. – If any passenger suffers “cold feet” on the launch field they may forfeit the full fare per person and not be given a refund. This will be at the discretion of Outback Ballooning depending on the circumstances. – No fee is charged for cancellations more than 24 hours before the flight. Any flight altered within 24 hours prior to flight date will be at the discretion of Outback Ballooning and dependent upon flight availability. Direct bookings – by providing your credit card details to secure your booking you are agreeing to these terms and conditions and allowing Outback Ballooning to charge your credit card as applicable above. 3.2 No Show: You will be charged the full cost of your flight if you fail to show for your flight no matter what the reason. No refunds or flight rescheduling are allowed. Direct bookings – by providing your credit card details to secure your booking you are agreeing to these terms and conditions and allowing Outback Ballooning to charge your credit card in the event you fail to show. You may send someone else in your place if you wish. Please let us know the name of the replacement person before the flight. If you are unduly concerned about your ability to attend the flight, travel insurance is recommended (contact your Insurance Broker). NB: Separate cancellation and alteration provisions apply to large groups and customised events. These are specified on the group booking documentation supplied. Outback Ballooning reserves the right to amend these fees and notice periods. When special circumstances arise, some of these Terms and Conditions may be superseded by those published on your booking confirmation documentation or Gift Voucher. 3.3 Weather Cancellations and Rebooking your Flight: If your flight has been cancelled due to inclement weather conditions, we will contact you to organise an alternative flight date. If you are not able to re-book, you will need to contact your booking agent to arrange a refund. A cancellation email will be sent by Outback Ballooning confirming your flight was cancelled due to weather conditions and requesting you receive a full refund. Booking agent may at their discretion retain a booking fee. Cards are valid only when fully paid by the purchaser or distributor. Gift Cards cannot be redeemed for cash or refunded in part or full. Cards are transferable to other individuals with written permission of the card holder and are valid only for the period indicated thereon. Once the gift card has been redeemed (i.e. the flight date has been booked) all other terms relating to Alteration and Cancellation apply, however the value remains non-refundable. Gift cards are NONREFUNDABLE after 30 days of the purchase date. Your Gift Card is strictly valid until the Expiry Date shown on your Gift Card and you must fly within that period. Should you need to extend the validity beyond the expiry date, a 6 month extension is available at AUD$25 per person. No further extensions are permitted beyond this period. Please note that it may take several attempts to fly before a successful launch is achieved so Gift Card holders need to book well in advance of the expiry date. Please be aware that it is the purchaser’s responsibility to ensure that the recipient is fully aware of Outback Ballooning’s terms and conditions. As the purchaser or distributor of a Gif Card, it is your responsibility that the recipient of the Gift Card receives a copy of these Terms and Conditions. 5.1 30 Minute Flight – Passengers will enjoy approximately 30 minutes of ballooning, which could be the first flight or the second flight of the morning. Actual flight time may be more or less than 30 minutes and there will be no refund if the flight is less than 30 minutes. 5.2 60 minute Flight – Passengers will enjoy approximately 60 minutes of ballooning. On occasion, the flight time may be two separate, sequential 30 minute flights taken one directly after the other with a short changeover in between the two flights, depending on operational restrictions. The private charter of balloons will be subject to the total of the passengers’ weight. 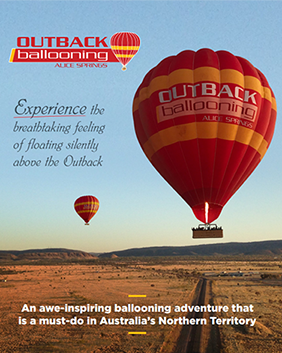 Quotes are available from Outback Ballooning for specific group sizes. Please provide each passenger’s body weight upon request for the quotation. Outback Ballooning operates hot air balloon flights daily all year round (subject to weather conditions and passenger loadings) excluding New Year’s Day, Christmas Day and Boxing Day. Outback Ballooning reserves the right to alter flight and pick up availability at any time. Passengers are required to confirm the day prior. Hot air ballooning relies on suitable weather conditions in order to proceed safely. Additionally, flights may depend on mechanical performance or staffing availability. When conditions are deemed by Outback Ballooning to be unsuitable or unsafe to proceed, then the flight will be cancelled. Similarly a flight may be cancelled due to less than minimum numbers being achieved. Outback Ballooning will not accept any liability for travel, accommodation, inconvenience or other cost incurred or lost through such cancellation. 8.1 Safety Requirements for Travel: Hot Air ballooning is an outdoor adventure activity using rural areas that can be uneven or overgrown for take-off and landing. Please come dressed in appropriate outdoor clothing, a hat and sturdy enclosed footwear. No high heels allowed. Loose items such as dangling jewellery and scarves are not permitted once passengers reach the launch site and dis-embark from the bus. Whilst the flight is gentle, landings can be bumpy and the basket may occasionally lay on its side with passengers lying horizontally for a short time. Please ask if you have any concerns. The packing up tasks at the end of the flight are optional and we appreciate your assistance in these activities. However, it does involve some lifting and participation is entirely voluntary. Passengers that are less able bodied are invited to stand back and take pictures of the fun. 8.2 General Mobility: Physical fitness is not a requirement to enjoy a ballooning adventure but passengers must be able to climb up (there are foot holes) and stand in the basket for the duration of the flight (with secure high sides to lean on, approximately 1.2 metres high) as there are no seats in some of our baskets. 8.3 Disabled Passengers: Any form of disability must be discussed with Outback Ballooning prior to making a booking and we do recommend that you seek medical advice before participating in a balloon flight. Civil Aviation Safety Authority (CASA) rules prohibit certain disabled persons for safety reasons. The passenger must be able to climb in and out of the basket in order to participate in the balloon flight. Each person is considered on an individual basis. Disabled passengers participating in the balloon flight do so at the own risk and the Operator accepts no liability for any damage or injury caused. The flight and carriage of any passenger will take place at the pilot’s discretion. 8.4 Pregnant Persons: Civil Aviation Safety Authority (CASA) rules and regulations and Outback Ballooning’s policy prevent us from flying women who are over 12 weeks pregnant. Pregnancy must be advised in advance. 8.5 Medical Conditions: Passengers with medical conditions should check their suitability to fly prior to booking and advise our staff when booking. As the entire tour lasts no more than 3-4 hours, passengers are advised to carry any necessary medication with them. Persons with medical conditions participating in the balloon flight and pack up activities do so at their own risk and the Operator accepts no liability for any damage or injury caused. 8.6 Carriage at Pilot’s Discretion: The pilot in charge of the balloon has absolute discretion in deciding whether a passenger will fly or not. Such decisions are made in the best interest of the safety of the passengers and crew and Outback Ballooning accepts no liability for any inconvenience or damage caused. Passengers not able to fly may, at the discretion of Outback Ballooning or booking agent, be given a partial refund through their booking agent or by Outback Ballooning if they booked direct. 9.1 It is your responsibility to ensure that you have received booking confirmation details of your flight: please notify our office immediately and prior to your flight date if you do not have this information. You are required to follow our checkin procedures outlined on your Booking Confirmation prior to your flight. 9.2 In the interests of safety, you undertake to follow the instruction of the pilot and ground crew, comply with any local codes of conduct and act sensibly and prudently at all times. You also agree to indemnify Outback Ballooning, it’s owners, officers and employees for all losses and/or damage arising from any act or default on your part or the part of a member of your party. Under no circumstances at any time during the supply of services should you or a member of your party be under the influence of drugs or alcohol, nor should you take medication that could affect or impair your judgment at this time. 9.3 Personal belongings are taken at your own risk. Ballooning is an outdoor adventure activity; Outback Ballooning cannot be held liable for damage to clothing. 9.4 Weight Notification: Outback Ballooning will require, for flight manifest purposes all passengers’ names and weights (in kilograms) – a weight above 100kg must be notified in advance prior to making a booking. 9.5 Photographs, Filming and Media: As part of your Hot Air Balloon tour, Outback Ballooning advises that photos and/or videos may be taken at any time throughout the flight. By travelling with Outback Ballooning you are accepting that you assign all copyright in such photos and/or film to Outback Ballooning & acknowledge that Outback Ballooning has & reserves the right to use such photos and/or films in any medium & in any reasonable manner whatsoever without payment or notification to you. 10.2 Extra Charge: A mandatory Civil Aviation Safety Authority Insurance charge applies to all passengers regardless of age which will be collected on the day of travel. If you have a prepaid voucher from a travel agent or supplier, you will be required to pay the insurance charge direct to Outback Ballooning on the morning of your flight. If you have a gift card, the insurance charge will be included in the amount prepaid at the time of purchase; there will be no more to pay on the day of your flight. The current rate for this charge is AU$30 per person. 11.1. All passengers participate in a Hot Air Balloon tour at their own risk. Outback Ballooning does not, unless otherwise not permitted by law, accept any liability for any loss, claim, injury, or any direct, indirect, incidental, special, or consequential damage which may arise out of or is in any way connected with the passenger’s participation in the Hot Air balloon tour. 11.2. To the extent, if at all applicable, any liability of Outback Ballooning under any Australian Consumer Law is limited to the cost of providing the flight. 11.3. Under no circumstances shall Outback Ballooning be liable for any loss, claim, or any direct, indirect, incidental, special, or consequential damages (including but not limited to lost profits or savings) which arises out of or is in any way connected with the use of any information, any listing of any data on the Operator’s website, or any delay or inability to use this website based on tort, contract, strict liability, or otherwise. 11.4 – Outback Ballooning requires each passenger on the day to sign a Passenger Manifest and Flight Note Form before the flight. When you sign this, you are acknowledging that you have read and accepted these terms and conditions. Passengers will be briefed and given safety instructions on the day. This includes take off & landing positions. Join us for a flight of a lifetime!! !